OCHA/Vicky Prekabo Internally displaced persons in Bweramana camp, North Kivu, Democratic Republic of the Congo, collect food items. A new United Nations human rights report has documented “hundreds” of extra-judicial killings and cases of torture and sexual violence against civilians over the last two years in the eastern Democratic Republic of the Congo (DRC). 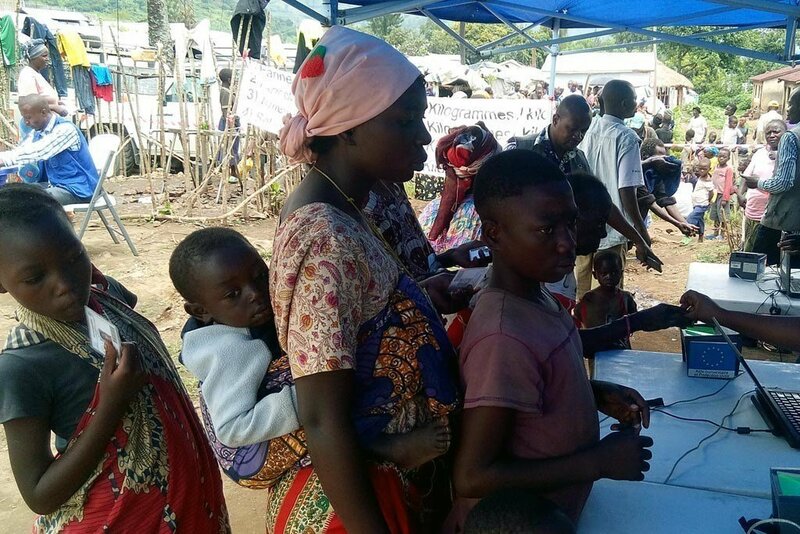 Between January 2017 and October 2018, the deteriorating security situation in the province of North Kivu, which borders Uganda and Rwanda, coincided with an alarming number of human rights violations and abuses, said the report, jointly prepared by the UN human rights office (OHCHR), and the peacekeeping mission in the country (MONUSCO). The rising number, and evolving nature, of violence by armed groups against the security forces and among themselves in order to control territory or natural resources, has been a significant factor contributing to the bleak picture, the report added. Women have been the worst affected, suffering kidnappings and horrific sexual violence, perpetrated by both the country’s armed forces., the FARDC as well as armed groups. UN High Commissioner for Human Rights, Michelle Bachelet, said sexual violence was being used in a “systematic” and “brutal” way by certain armed groups to punish and intimidate whole communities. “All efforts should be deployed to protect civilians – in particular the most vulnerable – and prevent such atrocities,” she underscored. The report also documents “massive” civilian displacement due to violence, as well as alleged violations of International Humanitarian Law. Leila Zerrougui, the Special Representative of the Secretary-General for DRC and the head of MONUSCO, underscored the need for credible investigations and the need to end impunity. “Without credible investigations to determine responsibility for every crime, and without judicial sanctions against the authors of these violations – no matter who has committed them – impunity will continue to prevail,” she said. The report also noted that armed group activity also affected the emergency response to the deadly Ebola epidemic in the Lubero region, where the violence triggered displacements both from and to Ebola-affected villages, most likely contributing to the spread of the disease. It also stated that the situation of high insecurity and of continuing rights violations could undermine the political rights of the population with elections scheduled this weekend.